raw mushrooms are gross. they’re reminiscent of cotton and dry and flavorless and i don’t want any part of it. what about mushrooms seared until they’re shriveled into wrinkly, prune-esque versions of themselves? sign me up. great description of seared mushrooms, i know. i want them still, especially since i’ve accepted my grandma status and love prunes. how about this: their flavor concentrates, they darken and turn golden a la the best toasted marshmallow out there, and instead of falling apart into bland, pasty crumbles like they did in their past lives, they become tender and hearty and dare i say meaty. SIGN ME UP. they also become the stars in this seared mushroom salad. this jumble of produce, croutons and prosciutto is an amalgamation of all the textures i crave when i have salad (admittedly, i usually don’t during fall and winter). there’s crispy (and garlicky!) bread, crunchy toasty nuts and slightly chewy mushrooms accompanied by the smooth slide of salty prosciutto, all atop tender lettuce and plenty of basil, oregano and green onions for that fresh crispness associated with raw veggies. if i’m eating salad when all i want is korean bbq and cozy pasta and soup, then it better be this one. 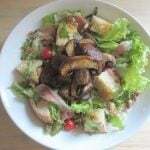 This seared mushroom salad uses one of my favorite salad tricks: mixing raw and cooked vegetables. The homemade croutons and silky prosciutto don't hurt, either. Make the croutons: Place the bread on a baking sheet. Bake at 350F until golden, about 8 to 10 minutes. Toss with rosemary, 2 T oil and garlic. Place the minced onion, vinegar and extra virgin olive oil in a small jar. Cover and shake to emulsify. Add the green onion and oregano; shake. Toss the greens and basil in a large bowl. Heat 2 T oil in a large skillet over medium-high heat until almost smoking. Add the mushrooms and remaining onions. Cook, stirring occasionally, until the mushrooms are golden, 5 minutes. Add the vinaigrette, stir well and remove from heat. Immediately add to the greens and toss once. Add the nuts, prosciutto and croutons; toss vigorously. Divide among plates. 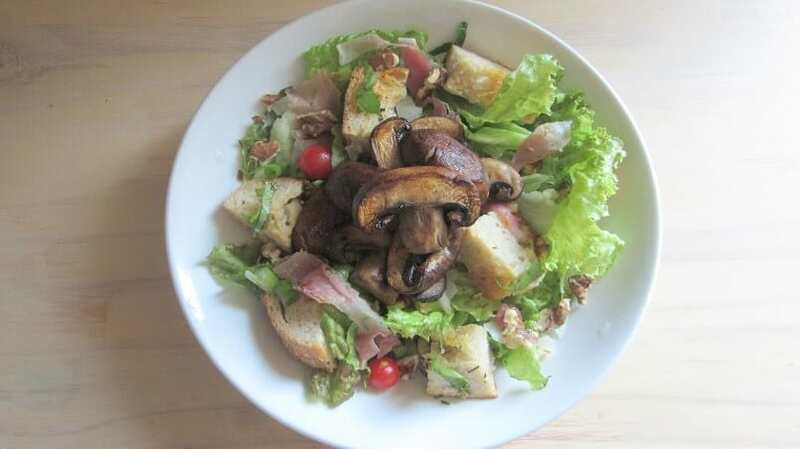 Serve this seared mushroom salad immediately. Adapted slightly from Jonathan Waxman’s A Great American Cook. I also added cherry tomatoes but not necessary, especially if it's winter and there are no good cherry tomatoes to be had. 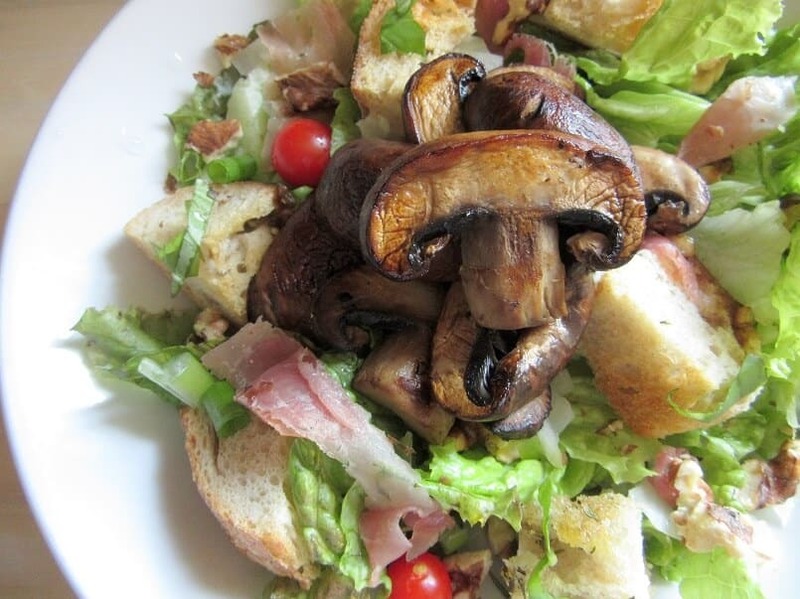 I love mushrooms and making them the centre of this salad is such a lovely idea. oh my, your ideas sound amazing!! how do you make polenta chips? i’m thinking a log of storebought polenta sliced into rounds and then baked/fried until crispy.